All of us are conditioned to believe that the sign above makes any product a better value to us than it ever was before. That sign works like a charm to get our attention and arouse interest. It has overwhelming power to attract; and seems to call us: "Come hither! The rewards are up; the penalties down; you may enjoy more treasure and less treasure is required of you." As we all know, reality often differs from our preconditioned imagination of what that sign seems to promise. We know, of course, the sign is overused. We know too that the sign is often misapplied, and a "sale price" for something at one vendor might be much higher than the "everyday price" for the same thing at another (see: http://bit.ly/1JXtEMg.) 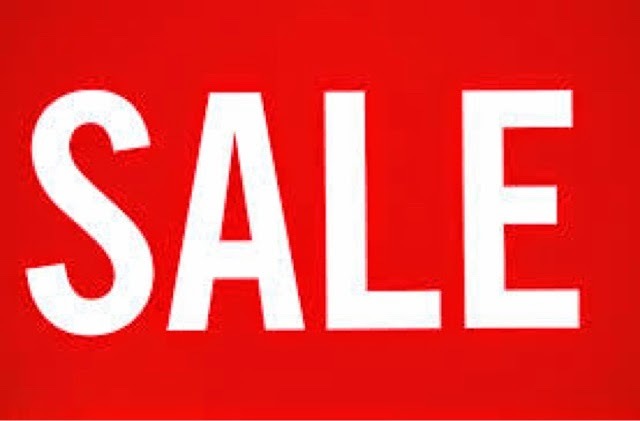 We know that the sign is often cover for what amounts to deception: promising big savings compared to an original price that in truth never existed; making us believe we must act immediately or forever lose the offer of big savings when in truth the opportunity is effectively perpetual, frequently extended and regularly repeated. 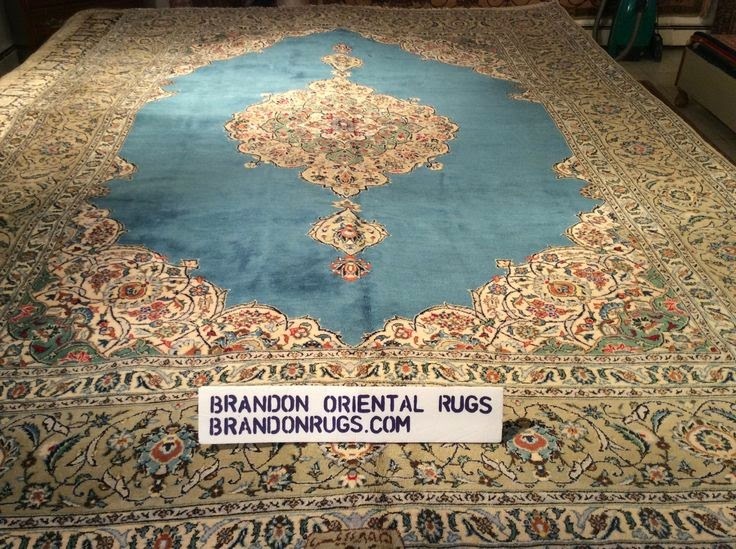 Brandon Oriental Rugs (www.BrandonRugs.com) invites you adopt a new paradigm, and overcome the conditioned response to the SALE sign; especially when it comes to shopping for fine quality handmade area rugs of every description. 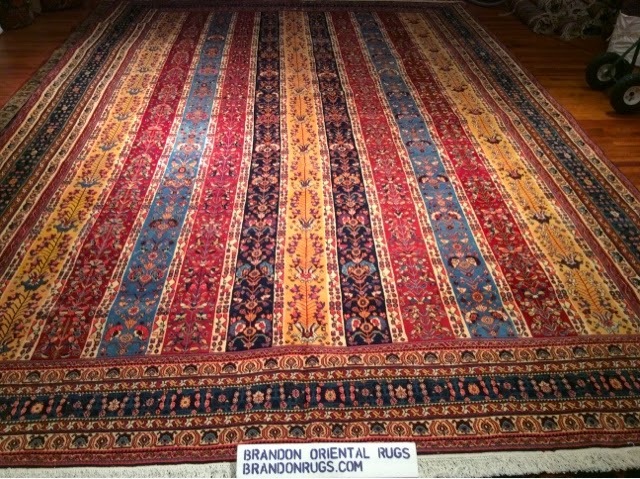 At Brandon, RUGS ARE THE ATTRACTION; their beauty charms you; their virtues speak to you; and acquiring something unique that nobody else can have is the opportunity you don't want to miss. 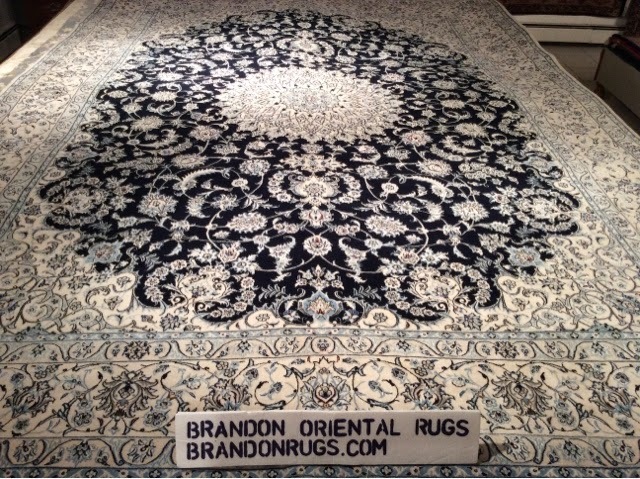 Of course, the fact that the everyday price for fine quality rugs at Brandon Oriental Rugs is actually better than the sale price for similar quality rugs elsewhere (including e-tailers, web-stores, and internet auction sites); and includes a host of useful services (like delivery with installation and a low pressure/take-your-time shopping experience) makes it easier to stop shopping in response to SALE signs everywhere, and start shopping for beautiful handmade rugs that can be purchased for the best price anytime without a lot of hype and hoopla. 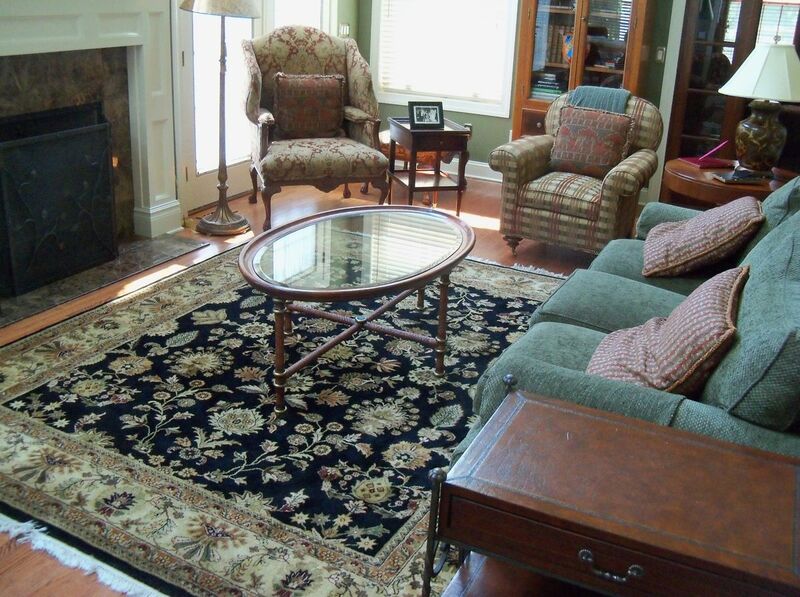 Oriental rugs are a stalwart of the living room, study and den. It's a look I love, (heck, my own living room has one! ), but in less likely environs, the rugs are equally if not more compelling. Consider throwing a rich rug of reds and blues down in the kitchen, bedroom, even the bathroom, for a classic look in an unexpected setting. 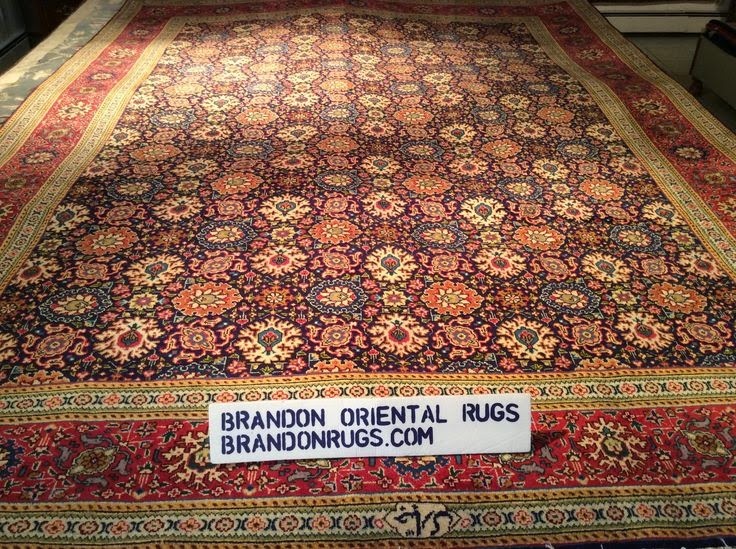 I'm using the phrase "oriental rug" in the broadest sense of the term, including Persian rugs (made in Iran), kilims and other tribal varieties. 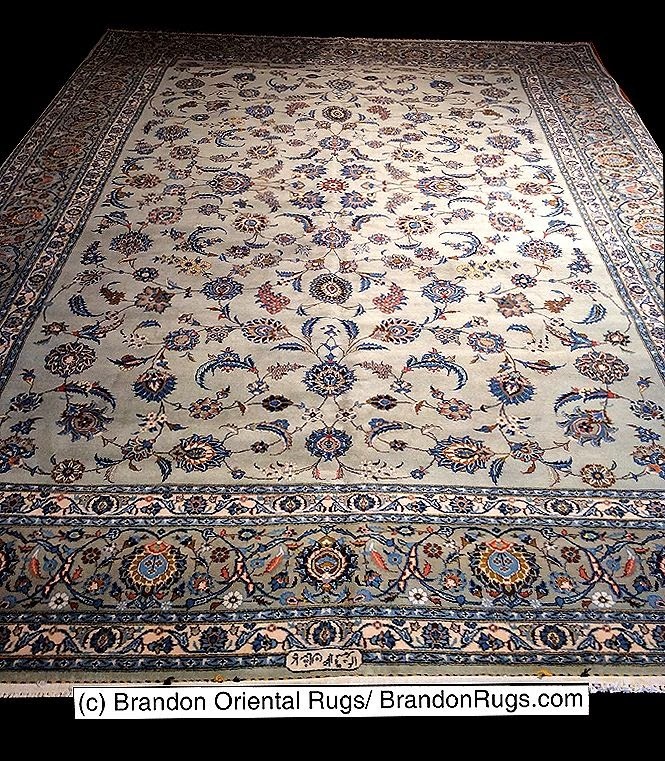 Oriental rugs are godsends for heavily trafficked areas; the rich colors and intricate patterns make them great at hiding stains. Here, a kilim looks eclectically marvelous juxtaposed against modern dining chairs. Light walls open up this small guest bedroom, while the rug grounds the space and sets the color palette. ... Or go for one runner in a galley. Switch out a boring bath mat in favor of something with a little more weight and personality. Notice how many of these rooms pair the rugs with bright white? It cools down the rugs' tones and make for a more modern aesthetic. The brick wall picks up on the deep red tones of the rug. They complement each other well. 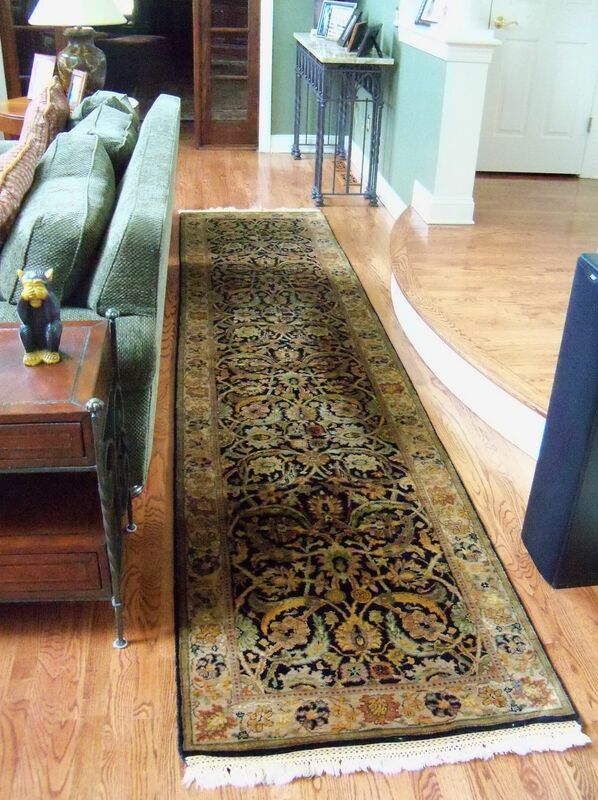 The colors in the rug's pattern are a great jumping off point for accessorizing a room. Keep toes warm with a large wool rug in the bedroom. Our customers in Basking Ridge, New Jersey invested in premium quality furniture pieces selected through their interior designer for the living room of their home. 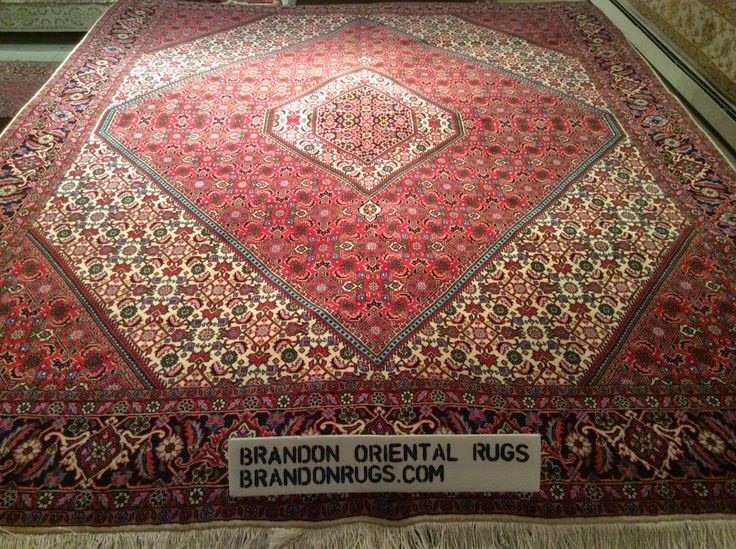 Brandon Oriental Rugs worked in coordination with their designer to supply a pair of real hand-knotted oriental rugs to complete the room. The 8x10 primary rug (above) unites the elements of the seating group; and helps to coordinate the palette of colors found in the fabrics and paint selected by the designer for her clients. The oriental rug is a new hand-knotted reproduction Persian Sarouk design made in India with a black background to anchor the room and impart a little extra dressiness to its quality look. The coordinated hand-knotted India Agra design runner above was selected to facilitate the flow of traffic along the walkway area between the sofa and the step-down into the room. 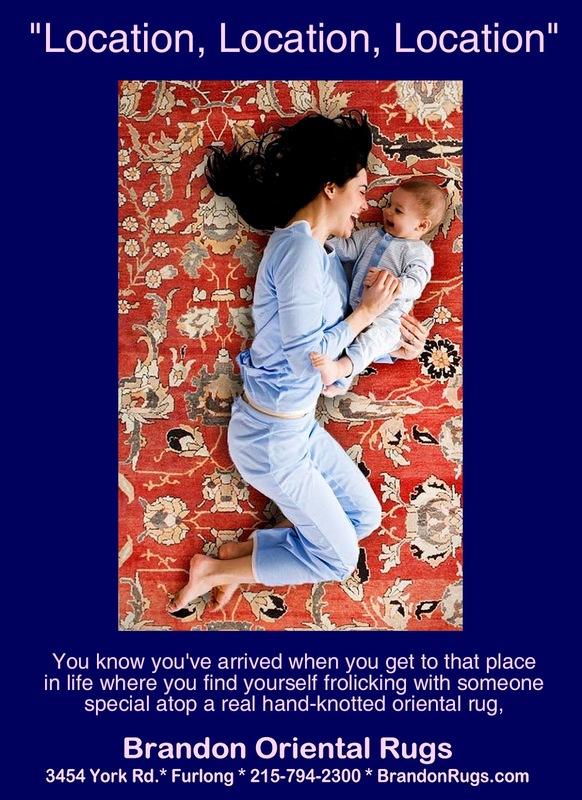 Oriental rugs are found at the centers of activity in homes everywhere.Think about all that happens in the life of a family around and atop them. They are not insignificant places. "Location, location, location." At some point, we all want arrive in the right place: the place to be. "Seek and ye shall find." You'll know you've arrived at one of those spots, the important places marked on your treasure map, when you find yourself and someone special frolicking atop a real hand-knotted oriental rug. 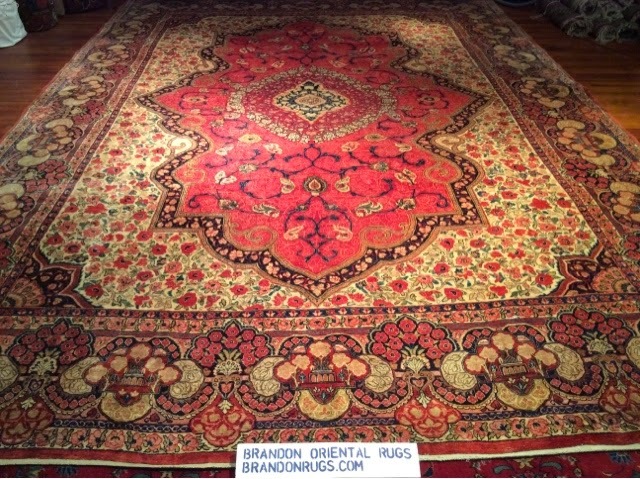 Bucks County, PA rug store, Brandon Oriental Rugs, makes your search for the right rug to bring into your home an enjoyable experience. We help you set the stage for all the happy times you'll enjoy around your rug during its long lifetime and that of your family.